11/15/12 • PATÉ TO THE HIGHEST POWER! Since this is a posting in which the star ingredient is none other than chicken livers, I should probably start by acknowledging one important detail: I’m not much of a liver lover. In fact, “not much” is putting it mildly—it would be more accurate to say I have a powerful aversion to the stuff. As someone who’s always been happy to eat pretty much anything, it’s a reaction I’ve struggled to overcome for years, beginning with the time my mother fried up a pan of chicken livers for dinner. Something about the sight of those livers in their uncooked state immediately put my ten-year old self on edge, as if I’d just been told I would soon have to repel down the side of a mountain, or sing a solo in front of my entire elementary school. But as the tempting smell of the meat overtook the kitchen, I convinced myself it could not possibly be all that bad. I was wrong—it was awful, in large part because the texture of the meat was (and is) for me the gustatory equivalent of fingernails on a chalkboard. After gagging through several mouthfuls and enduring menacing looks from my stepfather, I finally landed on the strategy of cutting the liver into pill-sized pieces and downing each one with a big gulp of water. Of course, it wasn’t long before my parents caught on, which was probably a good thing as there is only so much water a ten-year-old can hold. Long story short, I spent the rest of the evening alone at the dinner table, my plate of liver growing cold in front of me. 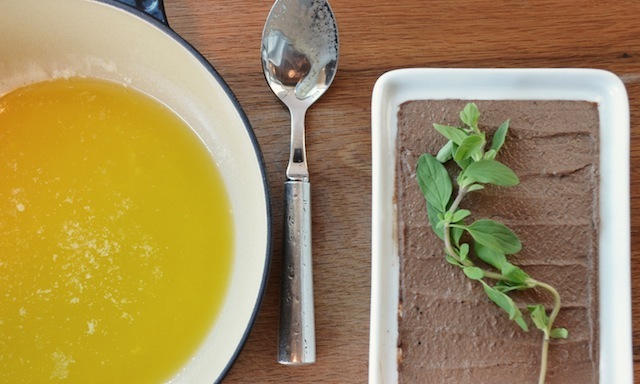 All of which is intended to serve as an illustration for just how miraculous this recipe for chicken liver pâté is. After all, it’s a dish that even I—an avowed liver hater—can’t get enough of. The recipe is one I first came across in the November, 2003 issue of Gourmet (my bible for all things Thanksgiving; seriously, many of my best Turkey Day moments have sprung from this one 230-page issue), and since then it’s found its way onto just about every Thanksgiving menu I’ve had a hand in creating, not to mention quite a few other memorable meals as well. As originally presented by the magazine, the pâté is meant to serve as an opening act to the main event—the perfect thing to distract your guests as you scramble to make the gravy and carve the turkey. And that’s exactly how I’ve employed it, though it has the added benefit of a weeklong shelf life (chilled and covered, of course) even after its butter seal has been broken. In other words, days later it still has the makings for a first-rate snack or even an easy dinner, the kind of meal you might have at a bistro somewhere, followed by a good bowl of soup. So what exactly makes this pâté so enticing? Well for one thing, like a lot of pâtés—particularly those that are mousse-like in their consistency—the grainy texture I find so repellant in liver’s original form is completely eradicated here, replaced by something light, buttery, and utterly un-liver like. 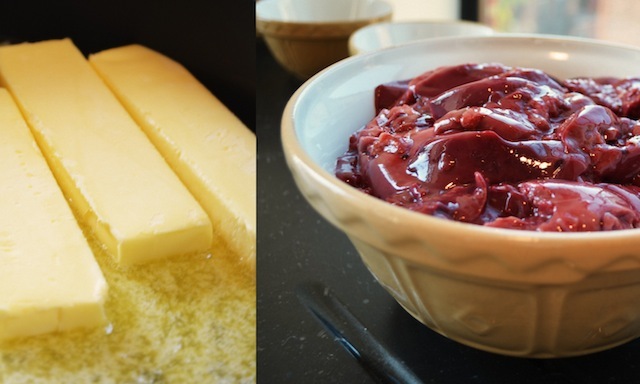 Here that transformation is achieved by puréeing the cooked livers (along with a variety of other tempting ingredients—more on those later) in a food processor until everything is smooth and creamy. It’s a process that completely eliminates the dry, chalky quality of the liver I find so unappealing, producing instead something that is light and almost feathery. I love this sort of culinary alchemy, particularly when the transformation is so dramatic and so easily achieved. And then you have those other enticing ingredients added to the liver during cooking, and which ultimately merge into a smooth, creamy whole, courtesy of that spin through the food processor. These include a large quantity of butter and onions (though not as much as pictured here—as noted below, for the purposes of this outing I tripled the recipe, so only one stick of butter is needed to sauté the onions and not the three shown above! ), as well as a little minced garlic and a sprinkling of seasonally appropriate aromatics, such as thyme, sage, marjoram, and allspice; just the flavors needed to brighten the intense earthiness of the livers. In fact, this pâté is one of those rare examples of a dish in which each of the ingredients strikes a harmonious balance, while still retaining their distinctive flavor. In other words, there is nothing muddled about the end result here. To underscore this point, consider the 2 tablespoons of bourbon, which are added to the various other ingredients in the final moments of cooking, once the liver has achieved its desired degree of doneness (brown on the outside but still pink within). 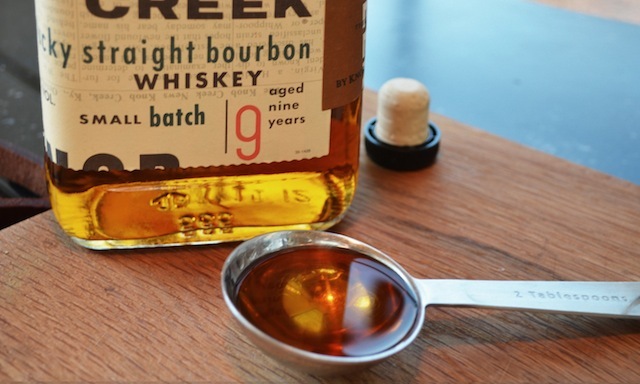 Although the bourbon combines seamlessly with the aromatics and the liver to create something that tastes bright with a just a hint of earthiness, listen closely and you can just make out the sweet, caramel-like note delivered by the liquor. It’s an addition that provides the perfect counterpoint to the richness of the liver, and is one more reason the finished product is near-impossible to stop eating. If all this sounds decadent, that’s exactly the point (it’s Thanksgiving after all!). And yet there’s one last addition to make it richer still: a quantity of clarified butter. This is added in the final stages of assembly, after all of the ingredients have been cooked together, puréed in the food processor, and then transferred to a 2½ cup-sized crock or terrine, the surface of the mixture smoothed to a uniform consistency with a small spatula if you have one. Garnish the mixture with a sprig of thyme, sage, or marjoram, and presto—you’re ready to add the butter. 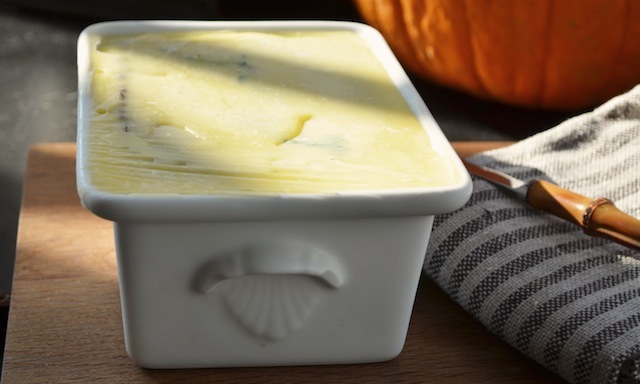 Clarified butter, of course, is simply melted butter that’s allowed a few minutes to cool—a period during which the milk solids will either float to the top or sink to the bottom. As you’ve probably guessed, the goal is to eliminate these, so skim the froth from the surface, then carefully spoon the clarified butter across the pâté (avoiding the white stuff at the bottom of the saucepan), until the surface is covered with about a 1/4-inch of butter. Allow this to set for a 1/2 hour or so and once firm, cover with plastic warp and transfer to the fridge, where it will happily keep for up to two weeks (or one week, once the butter seal has been broken)—making it a kind of Thanksgiving secret weapon since it’s one thing that can be made well in advance of the big meal. Once hardened the butter serves as a kind of lid that seals in the liver’s freshness, though it also offers a counterpoint to the pâté itself—both texturally and in terms of flavor. 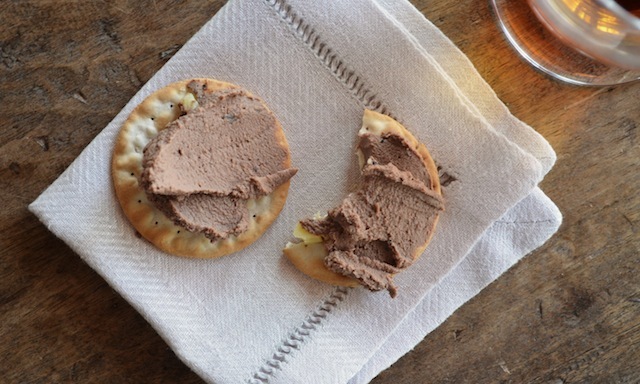 So while the butter introduces a hint of creamy sweetness into the richness of the liver mixture, it provides a pleasing foil to the texture of the pâté as well, like biting through the hard shell of a chocolate to find something soft and nougat-y at its center. Spread across a cracker or a toasted baguette slice, the butter/liver combo provides pretty much everything you could want from a pre-meal warm-up, though for those who like their pâté in the company of something just a little sweeter, a dollop of fig jam might also be considered. Either way, it’s just the thing to get the most anticipated meal of the year off to the best start possible . . . And who knows, you may even change a few minds about liver along the way. TRG Note: Don’t be confused by the quantities shown in these images; I tripled the recipe. 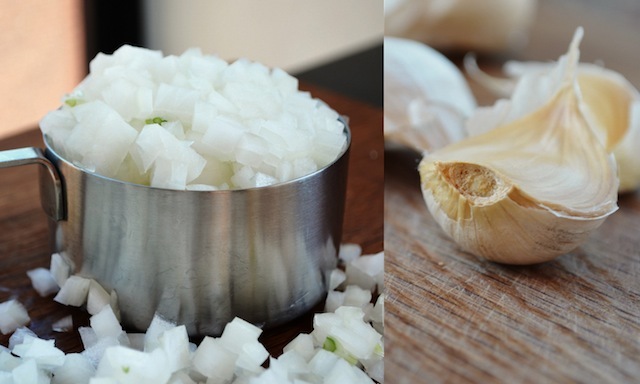 —Melt 1 stick butter in a large nonstick skillet over moderately low heat, then cook onion and garlic, stirring, until softened, about 5 minutes. 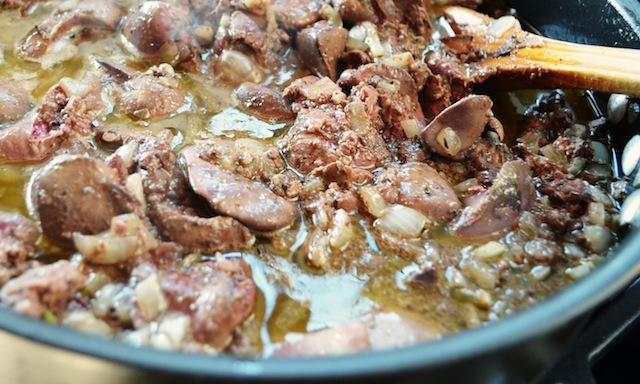 —Add herbs, salt, pepper, allspice, and livers and cook, stirring, until livers are cooked outside but still pink when cut open, about 8 minutes. (Note from TRG: If doubling or tripling the recipe as I did here, this process will likely take longer—between 15 and 20 minutes.) Stir in bourbon and remove from heat. 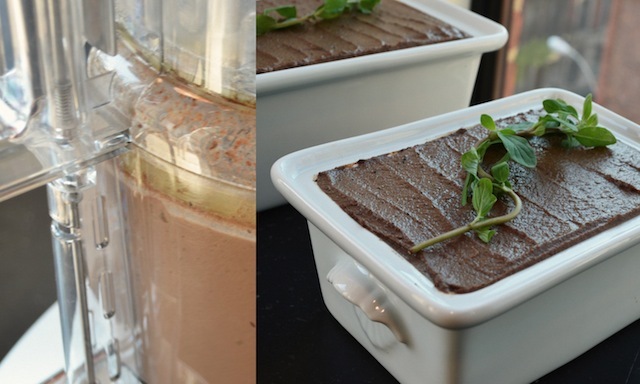 —Purée mixture in a food processor until smooth, then transfer pâté to crock and smooth top. —Melt remaining ½ stick butter in a very small saucepan over low heat, then remove pan from heat and let butter stand 3 minutes. 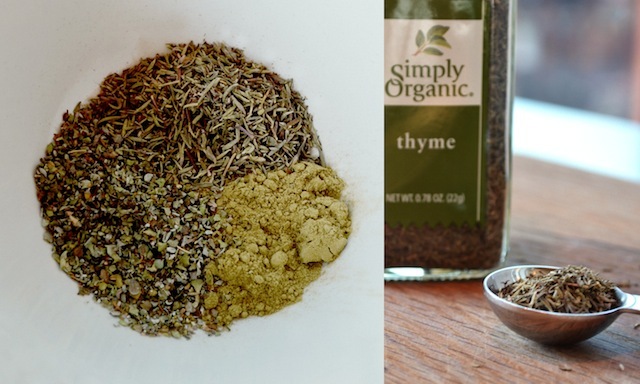 —If using herb garnish, put sprig on top of pâté. Skim froth from butter, then spoon enough clarified butter over pâté to cover its surface, leaving milky solids in bottom of pan. —Chill pâté until butter is firm, about 30 minutes, then cover with plastic wrap and chill at least 2 hours more. 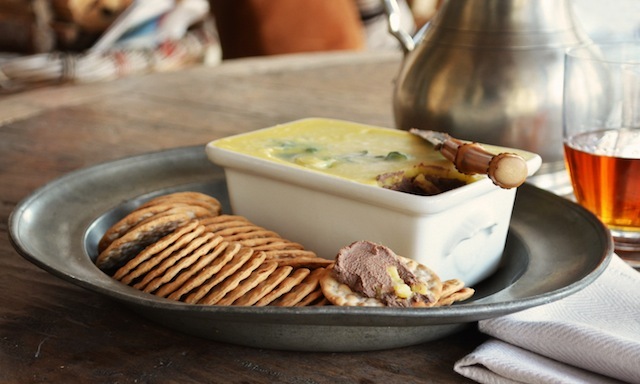 Note #1: Pâté can be chilled up to two weeks. Once butter seal has been broken, pâté keeps, its surface covered with plastic warp and chilled, 1 week. Note #2: The pâté can be eaten the day it’s made but will be even better 1 or 2 days later. Thank you so much for this recipe, Brad. The mother of my son-in-law had asked me to show her how to make chopped chicken liver. I told her that I refused to make the Jewish version but I would be glad to make a pate. I had previously used sherry not bourbon but I couldn't find the recipe. My new family raved about this at their Thanksgiving feast and there was very little left over. I gave you all the credit. Thanks Loretta. So glad to hear it was a hit! Hope you had a great holiday.